Today, 21 Adar, is the 220th yahrzeit of The Rebbe Reb Elimelech of Lizhensk, one of the main disciples of the Maggid of Mezritch, and, like his Rebbe, he became a “general of generals” in that many of the greatest Chassidic Rebbes of Poland, Galicia, Rumania and Hungary were amongst his talmidim. “It is told that before he died, Rebbe Elimelech bequeathed the sight of his eyes to the Chozeh of Lublin, the spirit of his heart to the Kozhnitzer Maggid, the soul of his mind to Rebbe Menachem Mendel of Riminov, and the power of speech to Rebbe Avraham Yehoshua Heshel of Apt. His disciples said, ‘Nowhere else than at Rebbe Elimelech’s can your hear a bit of truth.’ ” [Rabbi Aryeh Kaplan, Chasidic Masters, p. 55]. The following is my freely adapted translation of a story appearing in this past Shabbos’ Sichas HaShavua, by Zalman Ruderman, adapted from the sefer Tzentaros Zahav [Golden Pipes], Vol. 1, by Rav Mordechai Gerlitz. The Rebbe Reb Elimelech of Lizhensk would seclude himself once a year, during the 40-day period between Rosh Chodesh Elul and Yom Kippur. At this time, he would be alone in his room, totally involved in Divine Service. Except in the most urgent of cases, no one was allowed to disturb him. Knowing this, his Chassidim made sure to bring their questions or problems to him at other times of the year. One year, there was a very unusual occurrence which happened far from Lizhensk. A boy, the son of wealthy parents, began to act very strangely. Day after day, in both speech and action, his manner was…weird, to put it mildly. Shocked and embarrassed, his parents didn’t need a doctor to tell them that something was seriously wrong with their son. They summoned the best doctors in the area, to try to bring their son back to normal. They spared neither money nor effort in this regard. The loving parents even had to hire a special guard to be with their son, to insure that he would bring no harm to himself or others. In their frantic search for a cure for their son, they heard that there was a tzaddik in the town of Lizhensk, whose prayers and blessings worked wonders. 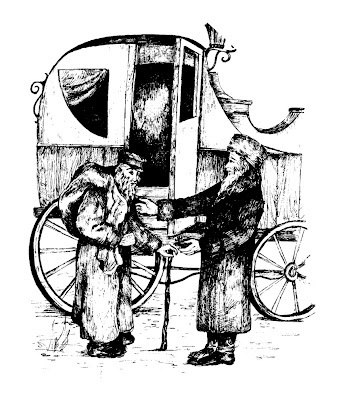 Although it was a very long journey, the father took his young son with him and set out for Lizhensk, with the hope that the tzaddik could help the young lad recover from his condition. As they approached the outskirts of Lizhenk, the boy suddenly noticed a poor man in tattered clothing, walking along the way. Turning to his father, the boy said, “Abba, please give the poor man some money.” The father, who had not heard a smooth, sane sentence from his son in a very long time, was surprised at these words, which were uttered very calmly. With a good feeling in his heart, the father took out a large silver coin from his pocket, called the poor man over to him, and gave it to him with a big smile. “Where are you headed, my generous Jews?” asked the poor man. “We are on the way to Lizhensk, to ask the Rebbe for a bracha [blessing] for a cure for my son who is next to me,” responded the father in a sad voice. “Does he really need a cure? He looks to be of sound body and mind to me! Why waste your time? You should just turn around and go home!” was the unsolicited advice of the poor man. Taken aback by these words of the poor man, who was so protective of the tzaddik, the father of the boy nodded to him, and they parted ways. Upon their arrival in Lizhensk, the father and son stayed at an inn, where the father wrote out his kvittel [a petition on paper] in brief, to which he added a large sum of money as a pidyon nefesh [a 'soul redemption'] – 12 gold pieces! Upon speaking to the Rebbe’s Chassidim, the man confirmed that indeed the Rebbe Reb Elimelech only saw the most urgent cases at this time. When he approached the Rebbe’s gabbai [attendant] near his room, he briefly explained his predicament, which was indeed deemed to be a most urgent case. He also mentioned the name of the far-away town from which he came, together with his son. He asked that these efforts not be turned away, and promised not to take up too much of the tzaddik’s valuable time. The gabbai went into the Rebbe’s room to ask if he would receive them, and was answered in the affirmative. The father presented the Rebbe Reb Elimelech with the kvittel that he had written, and placed the 12 gold pieces on the table. As the father was digesting this news that the poor man he met on the way, who had ‘diagnosed’ his son as completely healthy, was none other than Eliyahu HaNavi, the Rebbe Reb Elimelech extended his hand to him, to bid him farewell. The Rebbe then gave him his bracha and returned to his Divine Service. Zechuso Yagein Aleinu v’al Kol Yisrael – May the Rebbe Reb Elimelech’s merits protect us all! Sounds like the poor man they met on the way may have actually been the Rebbe himself. Maybe he slipped out of his room to go among the people incognito then, as other leaders occasionally did at times. Anon - I thought of that as I was reading the story the first time, but then at the end, the father of the boy would have recognized him! However, there's another story about the Rebbe Reb 'Melech that has that aspect. [And a similar tale is told about the Chafetz Chaim]. Once, a man was travelling to Lizhensk to get a bracha from the Rebbe. Unbeknowst to him, the Rebbe was actually in the same wagon with him. When asked where he was going, the man replied, "Why to Lizhensk, to get a bracha from the tzaddik, the Rebbe Reb Elimelech." "But he's no tzaddik, why would you bother going to him?" responded the Rebbe. An argument broke out, & eventually the man hit the Rebbe for insulting the Rebbe. When he arrived at the Rebbe's room and saw his face, he fainted. Upon his revival, he apologized profusely, saying that he really didn't know who he was. "Why do you have to apologize?" said Rebbe Elimelech. "You were right, and I was right!" In the same story about the Chafetz Chaim, the end goes, "Now I've learned that it's assur to tell Lashon Hara even about yourself!" 1. The best person to go to for a bracha is: a true Cohen. Hashem passes His Beracha to the Kohen. And only a true Kohen can pass the full Bracha from Hashem to all of Am Yisrael - for material and spiritual blessing. In ancient times, where there would be a difference of opinion between the Melech and the Cohen, the Melech, the King, would always have to defer to the Cohen. This demonstrates the extremely high stature of the Kohen. 2. The Cohen has a specific function to act as an “interface” between Hashem and the Jewish People – and to bless them. The Cohanim are specifically commanded to bless the Jewish People, “Be’ahava” - “with Love”. The Shechinah, the Presence of Hashem, is only able to rest on the Cohen, as he is a true descendant of Aharon HaKohen, the first Cohen HaGadol. There are numerous people who fall into the above 3 categories. These people are regularly pronouncing the, “Birchat Kohanim”, or giving ‘brachot’ to the Jewish People. They have no right whatsoever, to do this. And they are actually “taking over” the role of the Cohen - for themselves. • This should be corrected speedily, so that the role of the Kohen to give brachot, is returned to him, and is no longer usurped by others. • Rabbis and rabbonim should have the humility to direct a person in need to a true Cohen. 4. Those who need a brocha would be well advised to find someone who is known to be a true Cohen. Those seeking a bracha should be made aware, that the full Bracha from Hashem can only pass from Hashem, to His true Kohanim, and then to the Jewish People.